There are some Cowboys topics on my mind this morning, as we get closer and closer to "Go" time. Bryan Broaddus chatted with us a few weeks ago, and things went so well that we wanted to do it again today. As you may already know, Bryan is a long-time scout and personnel man in the NFL. His experience served the Dallas Cowboys and Green Bay Packers well, and now we can pick his brain. Last time, the chat was 100% about the offense, and the various ideas Jason Garrett may utilize and employ this season, so now let's examine the defense with Broaddus. You can follow his Rapid Reports on CBS Sportsline and can find him on ESPN Radio. Obviously, I include others for Cowboys-specific reading, but mostly, those are the 5 sources of my daily football reading. They are all geniuses in their own way. I highly recommend them all, as in pretty much every case, I have been following their writing for years and years. With that in mind, I wanted to draw your attention to a conversation Pat Kirwan was having yesterday on Sirius NFL Radio when I rolled by his show with Tim Ryan. Can Roy Williams Handle the Job? Roy Williams. And Roy Williams. According to my notes, they played in exactly 1 game together as Dallas Cowboys team-mates. It was that amazingly forgettable day in St Louis when Roy Williams (OU) and Roy Williams (UT) joined forces for the Dallas Cowboys. One day is all. And then Roy Williams (OU) broke his arm and was lost for the year and will now resume his career in Cincinnati. Best of luck to the Bengals. Before he left, we all had a chance to see on full display the level of maintainance that he required from time to time. He did not like people saying things about his performance. He did not like criticism. And it appeared to actually negatively effect his play over the course of time. Since some of you have asked - and more importantly, since we have never done a football season here at Inside Corner - Here is what we have planned for the NFL weeks once the regular season joins us in just 2 weeks! Mondays: Post Game Notes from the Cowboys game as we have been doing for years - by the way, kudos to Eric Celeste for filling in last week. I think that he should feel more than welcome to add his thoughts to mine anytime he pleases. Anything to enhance the football content around here is good. Tuesdays: A breakdown of the offense in a very nerdy sort of way. If you followed these breakdowns last season you know that is it my goal to come up with theories about how and why the Cowboys attack with the ball. If we understand what they like to do in certain situations - and what they don't like to do - then we are more informed than the drunk guy who wants to know why they don't pass more on 3rd and 2. At least, we think we are. In fact, in the days to come, I will try to give you a synopsis of what we learned in 2008 about Jason Garrett. I will admit right now that Tuesdays are not for everyone. Wednesdays: Wildcard. Chat? Column? Email? Not sure. It may change every week. Thursdays: Breaking down the opponent. Making sure you know everything you need to know about the opponent by using their newspapers and their websites. We need to analyze this enemy. It starts with watching their last 3 games so we are ready for them, and then reading everything so there are no surprises when they get here. Fridays: Game Preview time. We have all of the information, now we need to ponder the match-ups and situations that will decide the winner and loser. This is where we all get together and work it out. So, there you have it. My plans for the season. Will there be the occasional bonus postings for other things (college football, hockey, and Ask Sports Me)? Sure! But, this is the template for the Cowboys season. This is the type of post you don't get from me very often, but if you have been a long-time reader, you know there are a few things that can get me blogging off the sports road - with one of them being my trips to Guatemala to serve the children of that country for a few days of my time. A few years ago, it is very possible I was experiencing some sort of mid-life crisis. I was certainly happy with the life I have been blessed with, but I still wondered if this "was all there was". I was asking myself if there is more to life than the daily/weekly/monthly/yearly grind of accomplishing goals in our careers, paying bills, and saving money so we can get that new kitchen that our wives want. Don't get me wrong - there is much to be said about enjoying a Starbucks, while driving an SUV and checking the IPhone for new emails (not while driving, of course) but it just seemed that the countless laps around the calendar that we all run can appear a bit hollow if we aren't careful. So, in 2007, I found some guys at my church who happen to take part in "Short-term Missions". I didn't know what that meant really, but it involved taking of your time and giving a little love and attention to kids who perhaps didn't win the lottery when they were born. Some of the trips are a few weeks long, but I just don't have that amount of time. So, I found that there are also trips that are a few days long, and decided I would give it a try. Enter Guatemala in September of 2007. And March 2008. And August 2008. And the latest, this week, in August of 2009. The trips are through Buckner International and a group of 9 of us went down there this week to do what we always do - hang out with our kids. Sure, there are a few minutes here and there to see the sights of a beautiful country, but primarily, we head to the same orphanages that we do each trip and share some good times with many children. Sometimes, we see the same kids - other times, we wonder where our friends have disappeared to from our last trip. The stories of pain and heart-ache are off the charts. Sometimes, it is best just to push them on a swing or play catch rather than try to ponder the lives that some of these children have been forced to live. Thursday: We started at the Buckner baby home and day care. Buckner runs a home that houses many children who are young and adorable. Some are up for Foster Homes and others for national adoptions. At this time, there are no international adoptions to the United States from Guatemala. I sure hope this changes soon, because I know that there are many willing families, and even more kids who have already had their lives changed by this as they now reside in the U.S. But, for now, the clock is ticking, and there can be no international adoptions. I was able to see some of my old friends there, like little Krystal, who I wrote about last time I made the voyage to Guate. She is getting bigger and bigger, and now, instead of doing animal sounds with me, she has moved on to learning her colors in English! Very cool. Now, when I point at a blue shirt, she says "Azul...Blue" and a red shirt gets "Rojo....Red". I would definitely bring her home to my family if adoptions could happen from there to here. The kids are loved, and the care they are getting from the Buckner people down there is very encouraging. They may not all have "real" families, but they do have a family - all of their brothers and sisters that circumstances brought together at the Buckner Baby Home. After playing with the kids, it was on to our old familiar stop, the San Gabriel boy's orphanage. This is a state-run facility that houses boys between 8-18 years old. Each has a story that would make you sad, but perhaps no sadder than the next one. We play sports with them and goof around with them. Basically, make them the center of attention for an afternoon. Soccer, Basketball, Kickball, or whatever we can think of. The boys are no different than your boys - they love to play. They love to compete. And they love to be loved. I have now gone back 4 different weeks to this orphanage, and I will tell you that progress is happening. It may be slow, and it may require way more, but things are better. The boys seem to have some order, and the violent ways that I discovered in my previous trips was not on full display. The most telling development is that you no longer have to go through a junk yard to get to the front door. They have paved a road, and cleaned up much of the trash. Perhaps, it is getting to a point where the boys of San Gabriel truly have a chance in life. Friday: The morning was spent looking around Guatemala City a bit from a tourist perspective. I had never seen the Royal Palace or the Plaza Mayor, but I wanted to check it out briefly in our trip. I think my perception of the city was off, because on our trips, we often only see very poor parts. Guatemala City is quite beautiful, and like any other city in that part of the world, it has its good parts and bad. Then, off to one of my favorite places on earth. Antigua, Guatemala is the former capital of the country, until an earthquake changed things in 1773. Now, it is a pretty big tourist spot and one of the most charming places I have ever seen. It is also home of Manchen, which is the female equivalent of San Gabriel. Like SG, Manchen is home to somewhere between 50-75 girls between the ages of 8-18. Many of them have stories that would bring tears to your eyes, and several of them have already had children who live right there at the home. Certainly the victims of abuse, these girls are a different dynamic than the boys - as playing sports doesn't appeal to all. Here, it is a lot more talking and sharing stories with the girls and practicing our skills at eachothers languages. The girls are also happy to have attention and someone who is interested in their life without any agenda. The girls home is a completely different experience, but I must tell you that I never forget the hours there. Those girls have been victimized plenty in their short lives, and to share a smile with them is priceless. After our time with them was past, we met the 7 boys from the boys transitional home …That home is comprised of boys ages 14-18 who are selected from the San Gabriel orphanage to prepare for independent living and adult life that is ahead. 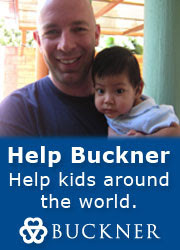 Currently Buckner has 1 boys home in Guatemala City, but are soon to open a 2nd. Each one can house about 7 or 8 boys, and a host family that is very neat. Some of the guys on our trip knew these boys back in 2005 or 2006 when they were just one of the many faces at the hopeless orphanage. Now, they seem very well adjusted and full of hope for their futures. We met them for some soccer, and were pretty promptly shown how weak our game is compared to high school age boys from Guatemala. The only difference in our game with the boys this year is that the 2nd home is now open. Twice as many boys and our soccer has not improved. These boys are studying hard and appear to have their lives on the right track. I am so impressed with what Buckner has helped create with these homes. In the afternoon, it was back to San Gabriel. This time, we played more sports and brought the boys new shoes. What a moment to remember when you wash their feet and put new socks and shoes on them. It is meant to demonstrate that we are there to serve them and show them - for once in their lives - that they matter. And that we want them to realize their future can be wonderful. I believe they have been marginalized since birth, and perhaps showing them that they are important boys gives them self-worth that can be valuable. When we left, they lined up and bid us goodbye. One boy after another expressed their gratitude for our time and for our faithfulness in coming back year after year. They had never done this on one of my trips before, so it was quite emotional to listen to them talk to us at great length. Great kids. Some, who I have now seen 4 straight trips. I really want those boys to make it into the transitional homes and start their new life on the outside. Sunday: Much like last year, we stayed an extra day and take some of the transitional boys on a field trip. This time, it was a fishing trip to the Pacific coast of Guatemala for some deep sea fishing. Once again, we had some good bonding and adventure with the boys, and despite not knowing anything about fishing - especially for sailfish and marlin, I enjoyed it for 15 minutes of gold. He had to wrestle it for 15 minutes, and when they brought the fish in for pictures and set it free, the trip was worth it. I cannot believe that fish is small by ocean standards, because when you stand next to a fish that is bigger than a large man, you simple marvel. Crazy. Anyway, by Sunday we had more memories that we could ever retell, but I am again reminded how many kids need love and help. These are my kids. The boys and girls of Guatemala are in my heart. But, elsewhere, around the world, there are millions more. I know you love your kids, but perhaps you could help a few others along the way, too. If you mention Buckner, you know you can direct people to me if it helps. But they can also go to our website www.buckner.org and sign up to "Be a Voice" where they can specifically designate their gift to Guatemala operations, or anywhere else they want it to go. 100% of their donation will go to the area they designate, so that's why we want it to go to overall operations, "where needed most" is the best designation. If you want to change a life, send them some money. If you want to change your life, go on a trip like this someday. You will return home with a completely different view of everything in your life. Thanks for taking the time to make it all the way through this long entry. Tuesday, and I thought I would check the mailbag on a number of various topics. However, I will warn you that much like the metroplex, the mailbag seems relatively baseball-intensive today. But, with "Bob being Bob", I just had to start with a football note. As many of you may or may not know (or care), I follow 2 NFL teams very carefully. The Dallas Cowboys and the Green Bay Packers. Everyone in the media has a favorite team, but they generally don't tell anyone for fear that they will be outed and are concerned that the readers/listeners cannot handle the idea that you did not grow up in Dallas and cheer for the Cowboys as a kid. Well, I did not. I was born in Wisconsin, so while I cover the Cowboys for a living, I also follow the Packers as a life-long fan (who has a Packers tattoo and a son, named Brett). Hopefully, that will explain why I watched every play of the Green Bay vs Cleveland exhibition game. It has happened. The last time it happened was in 1995 when Michael Jordan and the Bulls were taken down by the Orlando Magic. The time before that was probably when Buster Douglas beat Mike Tyson. The category is "When the Invincible becomes Vincible." It certainly happens to everyone eventually, and yesterday, on the final day of the PGA Championship at Hazeltine, it happened to Tiger Woods. He finally choked on the biggest stage. Woods, who is most certainly the most invincible figure in sports today, has shown that he bleeds like a human. And yes, he occasionaly can have such a bad day that it costs him a major in which he seemed to be in complete control. It was a Sunday at a major, and it seemed that most competitors of the PGA took themselves out of the mix as the weekend went on. Ernie Els, Vijay Singh, and then Padraig Harrington with his 9 on a Par 3 was further elimination of what appeared to be the "real" threats to Tiger winning his 15th majors. But, here was Y.E. Yang. A Korean who most of us - at least those of us who are obsessed with the greatest golfers in the world - had no idea who this guy was about 72 hours ago. And not only was he not reminding us of Jan Van De Velde in the 1999 British Open , by blowing up - but he was hitting winners. Surely, it is live football. It is real blocking and tackling. So, we should take note of some good things and bad things that happened last night in Oakland. And, of course, we would start with the scoreboard. Not only did Oakland outscore the Cowboys, 31-10, but they also outgained the Cowboys in yardage, 456-274. From the Bill Parcells school of scoring, every 100 yards should account for 7 points. Therefore, by that rationale, the Raiders should have scored about 31 and the Cowboys about 19. Regardless, it was not very close last night in the 2nd half. This speaks to what we have been saying all along about the state of the Cowboys. If the final record is completely dependent on the 22 starters of each team, then the Cowboys will have a very successful season. However, the NFL is a league of attrition. Injuries can and do happen. And often times it comes down to your 40th man on the roster doing his job or the 47th man on the roster doing his. In these battles, because of what appears to be some very sub-par drafting since 2006, the Cowboys do not appear to have a whole lot of quality depth. Incidentally, this premise may explain the Dallas Cowboys' performance in December and down the stretch each season. Hypothetically, the stretch is where you test the depth of a team. And if you continuously come up short late in the year, it may be because your 4th safety or 8th offensive lineman fails his mission. During the regular season, here at Inside Corner, we are planning quite a few weekly features to help you through a Dallas Cowboys season with more information than you could ever possibly need to get you ready for the following Cowboys opponent. Obviously, there isn't too much you likely are worried about regarding tonight's opponent in the preseason opener, but I thought I would have a few pre-season run throughs to refine the idea in my head for this feature known as "Analyzing the Enemy". I do plenty of out-of-town research every week for my own personal use, but since we are all now fast friends at IC, let's share notes with the class and see if that helps prepare for Sundays. This feature will run on each Thursday during the season, I do believe. It is a big day if you love the beautiful game today: First, you are seeing the first-ever All Soccer blog entry in the history of Inside Corner. I am sure it will be met with some level of resistance, but I can take it. But, the 2nd reason for happy soccer time is that today is another chance for our beloved United States of America National Team to get their first ever win in Mexico City (3pm, Telemundo - Channel 39). We seem to have plenty of success on our home soil, but when the US heads south of the border, they have managed just 1 draw in 72 years of matches in Mexico City. So, I wanted to mark this special day with a soccer chat with my buddy, Bobby Rhine. Chances are if you follow soccer in the area, you are quite familiar with his fine work - which includes well over 200 MLS matches for Dallas and now he is a member of the FC Dallas front office. August is not an easy month to get through, but the last several years I have made it through with the help of the Football Prospectus. The guys at Prospectus/Football Outsiders.com are great at breaking down football with the same statistical analysis that Bill James made famous in baseball. They don't allow the raw emotion of fans and message boards to affect their ideas - but rather they use the evidence. I think football, unlike almost any other sport, must be analyzed in that fashion. Emotion makes people boil everything down to Jessica Simpson being at Texas Stadium in a pink Romo jersey. Obviously, football is a bit more complicated than that. "Machine Gun Mondays" is back, but don't go falling in love with it all over again because it is on borrowed time. Once the regular season begins for the Cowboys (September 13 at Tampa Bay) you know that Monday morning means the morning-after game notes from the Cowboys, but for now....for a few more Mondays, let's take a trip around a wild sports weekend, shall we? I think the story to rock all stories this weekend was the Josh Hamilton developments from his night in January as he clearly and sadly fell off the wagon. I must tell you that this story bothers me quite a bit on a number of levels, not the least of which being that many of us have vouched for him dozens of times as being "authentic" with his story in a world of stories that are not authentic. Alas, He is human, and he definitely is chased by his demons on a daily basis. In a busy week of blogging, allow me to make sure I remind the readers about UFC 101, tomorrow night from Philadelphia. UFC 101 is surely not the quality of UFC 100 last month, but with Anderson Silva vs. Forrest Griffin and BJ Penn vs Kenny Florian, we clearly have 2 fights up top that should be excellent. Obviously, with UFC 103 on September 19, the PPV's are coming fast and furious. It is clear that Dana White is not worried about over-exposure and is laughing at the premise that "less is more". As long as people like me keep buying PPV's, they will continue to make more. $54 bucks every 3 weeks? I wonder where it hits a point of too many. Perhaps a few of these shows on free tv is a good idea, right? Anyway, If you have never seen Anderson "The Spider" Silva, then you owe it to yourself to check this monster out. He is so confident and dangerous in the octagon that despite knowing nobody is invincible, he seems very, very close to being just that. My fun fact for the very dangerous Kenny Florian, is that he is the MMA fighter who most resembles Ben Stiller. Not sure if that will help you much, but I just had to share that with you. Since this is the last day of training camp that I am spending in San Antonio, I thought I might work my way through some reader emails and elaborate a bit more on some various items that are on your sports minds as we enter the week of the first preseason game. Training camp has an interesting feel to it this year, and I feel like the Cowboys are set up to have a reasonable season that will allow some of them to redeem their good names on a national level. What that means in terms of wins is something we will only know as the season develops. I think "flying under the radar" suits them, and I think they actually enjoy the fact that they are picked to finish 3rd in their division this season. Working at America's Favorite Radio Station, we have the occasion to experience quite a few interns that come and go through our station on their ways to careers of their own. Well, under normal circumstances, I would never reprint one of their essays that they bounce off me. But, TC Fleming is not a normal intern (in my estimation). He is a young, promising sports dork. And as an older sports dork, I should know. Anyway, he wrote an essay this week that I wanted to share with you. It is all about the strides the Rangers havemade this season in the defensive department. I am not going to lie to you, this might be a bit deeper than some would like to go - given the enormous amount of Bill James-type statistics he uses, but if you enjoy that sort of data analysis, then you very much might enjoy this. The Giants are poised to make quarterback Eli Manning the highest-paid player in the National Football League, agreeing to a six-year contract extension worth $97.5 million, $35 million of it guaranteed, according to a person involved in the negotiations who spoke on condition of anonymity because no official announcement had been made. Eli Manning, at training camp in Albany on Monday, will reportedly become the highest-paid player in the N.F.L. The person said Wednesday that the final details should be finished later in the day and that the contract would soon be signed. Thanks, stay cool, and have a great summer. Bryan Broaddus is one of those guys who can say things because he has done things. For many years, Broaddus was a scout in the NFL for the Dallas Cowboys and the Green Bay Packers. He knows what scouting departments look for, and looks at football from a different perspective than many people in the media. I really, really desire to understand more of the NFL game from a coach/scout perspective, and I find you can only do this if you figure out what they look for. That is not terribly easy, but talking to Bryan whenever I can is one way to learn. And, unless you have worked in the NFL, you cannot learn enough of this great game. One thing we want to do here at Inside Corner as the Dallas Cowboy season goes on is quite a few chats with other people around the Cowboys World who can add plenty of wisdom to the conversation. Hopefully, you are familiar with the guys at BloggingtheBoys.com . They have some of the very best Cowboys analysis available, and I check it out all of the time. In fact, this year, those guys have put together an entire Cowboys annual that is on newstands now . I have my own copy, and I would love for you to check it out. Anyway, Rafael Vela is a writer who I have followed for several years. He is one of my favorites because he uses evidence rather than emotion to craft his opinions. I always prefer that type of mind over the "fly off the handle" emotional writers. His writings dive deep, and I generally enjoy what he offers. Anyway, he was kind enough to give me 60 minutes and we have about 3,000 words for you to consider this morning as we prepare for the 2009 season. It is time to do it again. Now, starting my 12th Dallas Cowboys training camp - 4 in Wichita Falls, 4 in Oxnard, and now #4 in San Antonio, Texas. The return of the Cowboys to San Antonio is not something I support, as being forced to go to camp in Southern California is something that I have become quite supportive of over the years. Usually, it is because of such things as golf without sweating, the ocean, and fish tacos.